Cloud by Ariana Grande is a new gourmand floral fragrance. This is Grande's fifth celebrity perfume. The new feminine scent includes notes of lavender, pear, bergamot, coconut, praline, vanilla orchid, and creamy cashmere. The perfume bottle loses the traditional pom-pom charm and gains a fluffy cloud shaped base and cap with a light blue hue bottle. 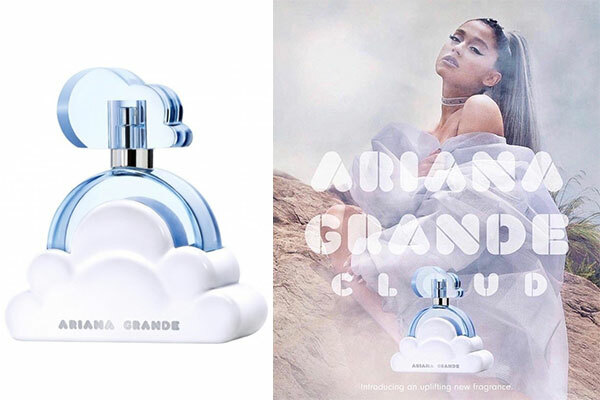 Launched in September 2018, Cloud is available in an eau de parfum spray ($40-$60) and rollerball ($20) from ULTA.